Under the influence of humanism, artists advanced anatomy and geometry to reach new feats of figurative accuracy and revolutionize renderings of perspective to reflect the human experience of place in space. In Flemish painting, artists such as Bruegel brought new techniques and an everyday sensibility to landscapes and still lives while in Germany, Dürer and Cranach pioneered an unprecedented drama and psychology in woodcut and engraving. 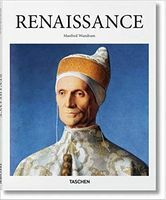 From Florence to Nuremberg, Venice to Bruges, this essential introduction in TASCHEN’s Basic Art series provide a dependable foundation to the transformative reach and sweep of the Renaissance era. Through the movement’s famed luminaries and lesser-known proponents, its social and political circumstance, and its diversions and developments over time and geography, we take in an extraordinary phenomenon of centuries of change that proffered individual genius, regional variety, and a wholesale reconfiguration of seeing and representing the world. 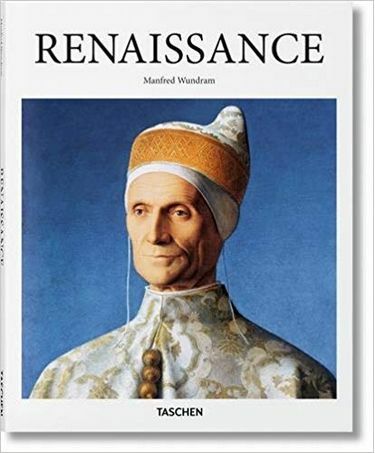 Featured artists include: Fra Angelico, Giovanni Bellini, Hieronymus Bosch, Sandro Botticelli, Pieter Breughel, Lucas Cranach the Elder, Albrecht Dürer, El Greco, Matthias Gruünewald, Hans Holbein the Younger, Fra Filippo Lippi, Masaccio, Michelangelo, Parmigianino, Pontormo, Raphael, Tintoretto, Titian, Paolo Uccello, Veronese, and Leonardo da Vinci.